Watlow® silicone rubber heaters are rugged, yet thin, lightweight and flexible. Use of these heaters is limited only by the imagination. Heat can be put where it is needed. These silicone heaters improve heat transfer, speed warm ups, and decrease wattage requirements. Fiberglass-reinforced silicone rubber gives the heater dimensional stability without sacrificing flexibility. Because very little material separates the element from the part, heat transfer is rapid and efficient. 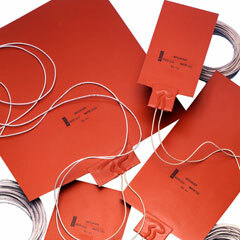 The silicone rubber heaters are constructed with a wire-wound element or an etched foil element. The heater construction creates a very thin heater allowing it to fit applications where space is limited.